If you have a lot of items that can be donated, we take this into account when pricing your junk removal. "They" - will give you a price based on how much room your load takes up in "their" truck. This price is formulated by assuming all your junk needs to be paid for to dispose of at the dump. This is not the case if your junk can be donated, recycled, or resold. If your junk is being removed from curbside or a garage it will load pretty quickly. If you are paying "their" volume charge you are paying too much because "their" volume price is based off removing items from an average load coming from the second floor. This again makes you pay more than you really need to. Their volume charge assumes everything is junk is mentioned above. However the old saying of "one mans trash is another mans treasure" always holds true. We discount loads taking the items of value into consideration as opposed to counting it as junk we need to pay to dispose of! These are just some of the main reasons NOT to use a company like 1800GotJ_nk and franchises like it. They just do not offer the customer the most bang for their buck by lumping all trash hauling jobs together in the using the same cookie cutter pricing structure. Why Not Get A Quick Quote? Our staff retention rate is 90% yearly. This is double the industry average. Its because we treat and pay our staff as professionals. This means our crews are better equipped at estimating jobs in a way to save our customers money, ensuring a repeat customer for life. Our drivers are not only thoroughly trained at properly sorting loads with regard to what we can recycle and donate. In addition, and more importantly, they have been trained in recognizing items of value and determining their fair market price. This translates to more discounted junk removal prices for our customers. 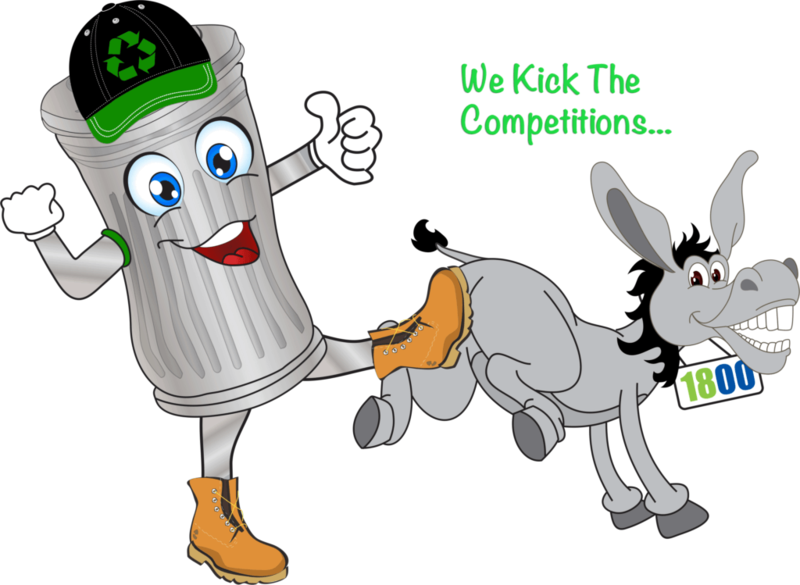 "Make our junk removal prices tailored to each individual job to ensure our customers the lowest reasonable price they will find"
To everyone's advantage we recycle. Paper, glass, plastics, metals, batteries, if they can turn it in to something else, we're letting em! Last year we recycled 500,000 lbs!! How's that... impressed?!! How about this if that wasn't enough... would it be stupendous if our pick ups started at just $35?!! That's 2 guys, with a 17' box truck, coming in to your home, removing your junk, cleaning up, and taking good care of it... that's impressive right? Ok one last whopper from Ole Willy himself for ya - HE'll PAY YOU FOR YOUR JUNK! That's right the crazy old fart will pay you for your junk! That's of course if he can sell it, you know his wife won't let him bring home all your junk? Where are you? Apartment or house, or even tree house? Is it heavy? Does it need to be sawed up?? Do we need a piano hoist?? Awkward to move? Can you even budge it?? What needs to go - and no we don't take husbands or wives!? Do we need 3 guys, 4, willy's entire family? even cousin bob!?? Is it a bunch of little stuff, do we need a crane truck? Is it in a barn, on a third floor, on a church roof!?? Yes, we have indeed seen it all. Which leads us to the point, we could put generic pricing up here on the site but, truth be told, we honestly give you the very best price we can to earn your business not just this time, but 5 years from now when you decide to tackle the basement! It just wouldn't be fair for one of us to do that, so lets talk. Give Willy a call and if we can't figure it out over the phone Willy will swing by and say hi and see what we can do for you. Thanks so much and hope to hear from you soon!